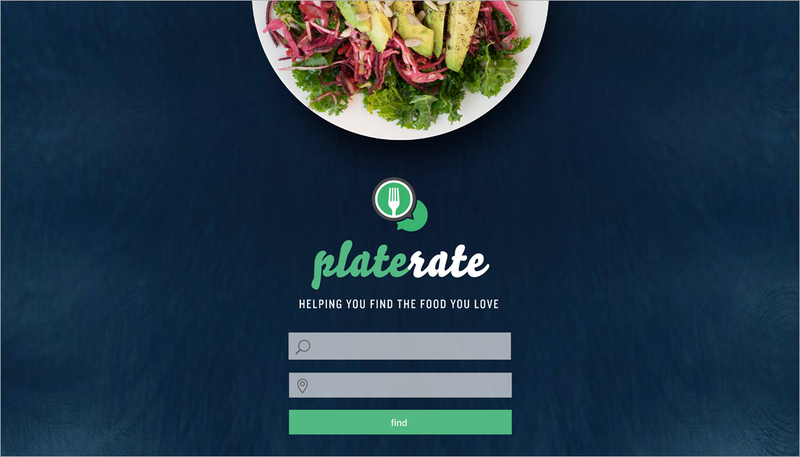 Plate Rate is the application that helps you find the food you love, while it matches your dietary needs. Design, document and deliver wireframes, user flows and interactive prototypes optimized for all devices. Collaborate with project managers, developers, Q&A Teams, back–end developers to ensure the user experience and interactive features and assets meet all design and functionality requirements. 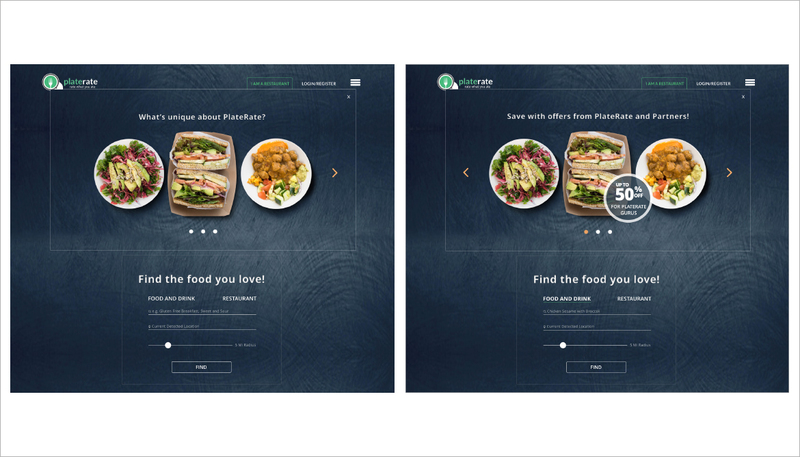 Provide additional support outside the scope of the UX/UI through image editing, image retouching and art direction. 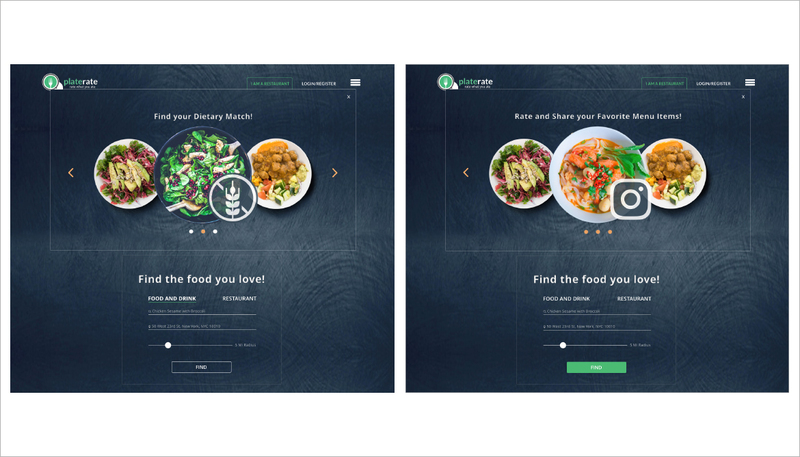 Improved the overall user experience using great visual language, use of color, photography and typography. Tests are showing an increase in user engagement and validating the relevance of our partner’s offers for PlateRate’s users. RESEARCH PLAN: Within my research plan I was able to identify my research objective, who my target audience is and establish a general hypothesis around my target audience. All interviews were in person and voice recorded with their consent. All recordings were recapped and summarized using an empathetic approach (ie. What did they experience? What was important to them?) From interviewing there was already a noticeable observation: our users considered that food for special diets was pricier than regular meals. COMPETITIVE RESEARCH: I wanted to understand how both direct and indirect competitive brands within the same space were presenting similar content on their apps. The information obtained was documented in a spreadsheet containing brand names and URL's along with notes pertaining to the specific elements, functionality and interaction design features that we could reference to build something better and unique. COMPETITIVE RESEARCH and FEATURE PRIORITIZATION: Through on–line research I was able to identify existing direct and or indirect competitors. Simultaneously these same apps were highlighted for specific attributes and functionalities that could enhance PlateRate service and business goals (rating systems, deals, etc). I was then able to define those areas that I considered most impactful, suitable to include them along with the proprietory features of PlateRate. PERSONAS: With the information I had from interviews and surveys I was able to create the characters that described our personas. FEATURES IMPACT AND EXPECTATIONS MATRIX: To help prioritize my features I developed a matrix with an emphasis on user impact and user expectations. 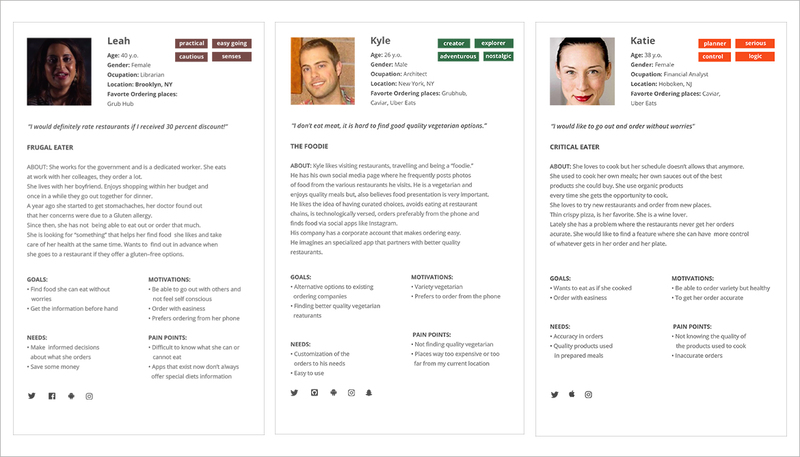 USER FLOW: After our personas and the feature prioritization were outlined I was ready to create the User Flow for ordering a meal for delivery. 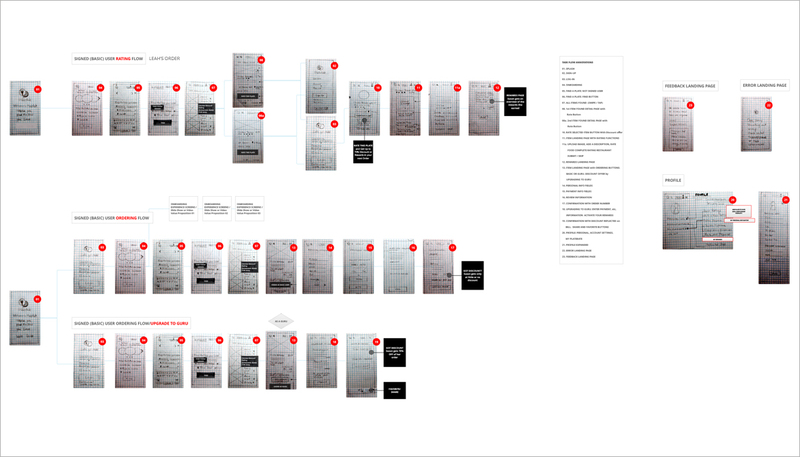 The user flow was first evaluated with my team, then adjusted and updated. The below diagram is a final representation of the direct and indirect pathways a user would take to complete their task. PAPER PROTOTYPE: Before commiting to a high definition prototype I outlined quickly the functions in a paper prototype to get feedback on early designs and test the personal diet match and restaurant discounts with potential users. Below you can see the value proposition for the desktop version.